American Indycar driver Conor Daly to Dale Coyne Racing for the 2016 season. 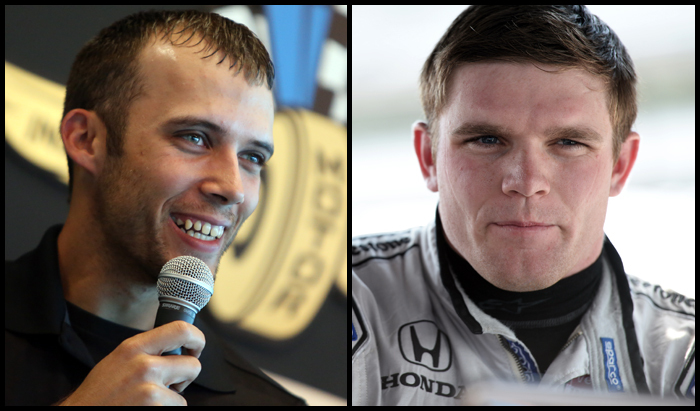 INDIANAPOLIS – Central Indiana based Jonathan Byrd’s and long time Verizon IndyCar Series team Dale Coyne Racing have partnered to bring a pair of young, American drivers to the 2016 Verizon IndyCar schedule. Bryan Clauson will drive the No. 88 Dale Coyne Racing/Jonathan Byrd’s Racing Honda as a one-off entry for the 100th running of the Indianapolis 500. This attempt to make the 33 car field will be Clauson’s third, having qualified and raced in the 2012 and 2015 races. Conor Daly will pilot the No. 18 Dale Coyne Racing entry for the full 2016 season. Sponsorship for the car will be provided by Jonathan Byrd’s Hospitality & Restaurant Group with the exception of the Indianapolis 500 where it will appear on Clauson’s entry. Coyne is exploring a number of options for primary sponsorship of Daly’s car for the 500. The partnership to bring these talented American drivers back to the Verizon IndyCar series was assisted by John Lopes, CEO of LST Marketing. Without the help of Lopes and his team at LST Marketing, the early start to the 2016 season would not have been possible. All parties involved were quick to agree this partnership would be beneficial. “When my son, David, came to me about this potential arrangement with Dale Coyne and related the story about how much Dale thought of their father, how he respected what he did in racing, and his love for racing in the Indianapolis 500, I was very pleased to give my blessing on teaming with Dale,” said Ginny Byrd, owner of Jonathan Byrd’s. Bryan Clauson may be attempting to make only his third Indianapolis 500 field, but he is no stranger to racing. The 26 year old has been one of the most prolific drivers to come through USAC by racking up 72 career USAC wins and four championships. Clauson has captured over 160 total career feature wins in the Sprint Car, Midget, and Silver Crown ranks. Conor Daly has participated in a variety of open wheel racing series in preparation of his debut Verizon IndyCar Series season. Daly began karting at age 10 and quickly moved into car racing full time. He completed two seasons in the Star Mazda Championship before moving up to Indy Lights. In 2011, Daly competed in five Firestone Indy Lights races and scored a sensational win at Grand Prix of Long Beach which vaulted him to the lead of the championship. He then made the difficult decision to leave the Indy Lights championship and move to Europe. Daly spent the next four season racing in GP3, GP2, and acting as an F1 test driver for Sahara Force India. 2015 provided Daly his first chance to prove himself as an IndyCar driver. With only 45 minutes notice, Daly strapped into the No. 18 entry for Dale Coyne Racing at Long Beach. With limited practice and without having any experience in the current car, Daly drove to what some described as the most impressive 17th place finish in memory. Daly went on to make several other starts in place of James Hinchcliffe during the 2015 season and earned a career best sixth place finish in Detroit. Despite these unexpected opportunities, a full season in the Verizon IndyCar Series was always the goal. “At one point in time, I specifically remember saying to Conor’s father, Derek, that if we ever had a chance to make it work, I would want Conor full time in an IndyCar and now here we are with it coming to pass,” said Jonathan Byrd II. “What Conor did in Europe with his incredible talent has always impressed me and his dogged determination to work hard to get a ride in the series makes me know he will do incredible work in the Jonathan Byrd’s machine! When festivities kick off at Indy, Bryan Clauson will be about a quarter of the way through his unprecedented 200 race 2016 schedule before shifting his focus to the Indianapolis 500. The team and Jonathan Byrd’s Racing will begin preparations to have the car and team in top form for opening day on May 16th. Conor Daly will begin to acclimate to the updated Honda HPD aero kit on December 14th and 15th as the Dale Coyne Racing team will take part in their second test of the offseason at Sebring International Raceway.